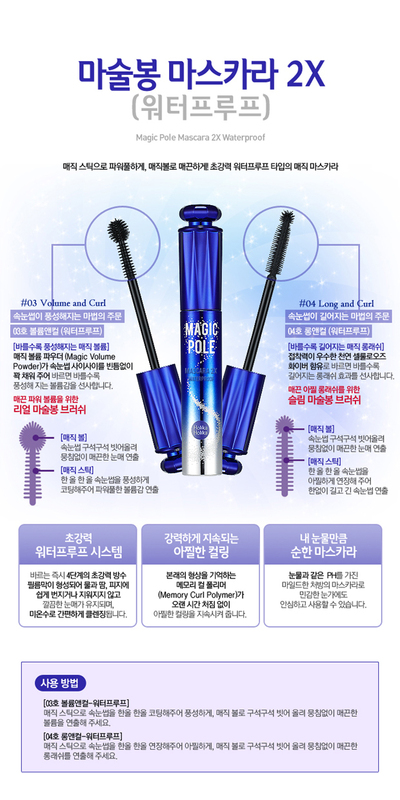 Make powerful volume with magic stick and dramatic curling with Magic ball. Mild formulation for eyes safety. #03. Volume and Curl: Gives power volume with magic volume powder. #04. Long and Curl: Contains natural cellulose fiber which has the excellant adhesive strength. The stick-part of mascara brush coats lashes to make amazing volume and the ball-part separates each lash.